New-look Old Mutual Wealth Global Investors reveal free thinking strategy and Former Old Mutual Global Investors boss Richard Buxton has revealed the philosophy managers will use at his new spin-off investment house. 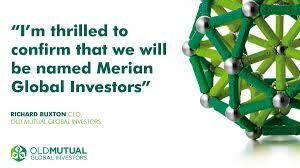 This week, Old Mutual Global Investors was officially renamed Merian Global Investors. Old Mutual Global Investor funds are traded alongside the majority of other fund managers’ funds on the popular platform Old Mutual Wealth, as well as on other platforms. Quilter completed the sale of single-strategy business Old Mutual Global Investors to TA Associates for £583m in June. Merian, which has £34.6bn funds under management, is named after the scientist, artist and adventurer Maria Sibylla Merian. He says the fund managers at Merian have freedom to think and act individually, since the company has no house view or chief investment officer.